On Tuesday afternoon, Rick tackled some of the trickiest work on our floor tile–the area where the new floor meets the old, which are slightly out of level with one another. But Rick worked his usual magic and smoothed out the transition quite nicely. 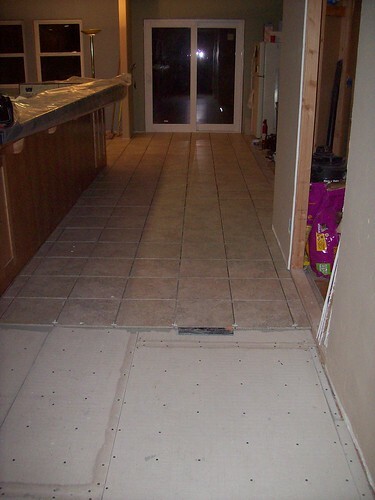 About 75% of the floor tile has been set now. All that’s left is the kitchen and the last 10′ of the entryway. 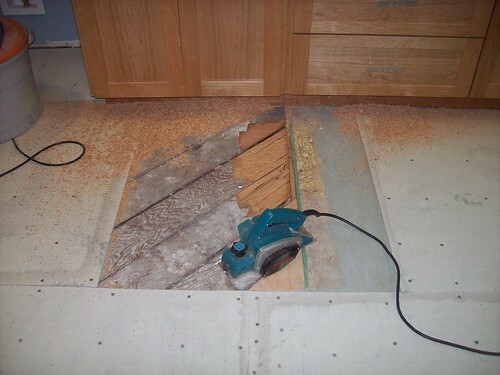 Speaking of the kitchen… The floor transition there was too severe even for Rick to fix, so I had to plane down the high side a bit. My Makita power planer paid for itself once again–it got the job done in *minutes*, and it came out great! The belt sander would have been far messier and probably wouldn’t have done as well, and doing this with a hand planer would have been a bear. The plan for the next few days is: Wednesday, finish setting tile; Thursday (and possibly Friday? ), grout *all* the tile; Friday, install baseboard behind appliances, fixtures, or wherever it will be hidden/difficult to do later; then over the weekend we’ll set up our laundry and kitchen! Oh I would like to see this when it is all done. I can see now it is going to be beautiful.